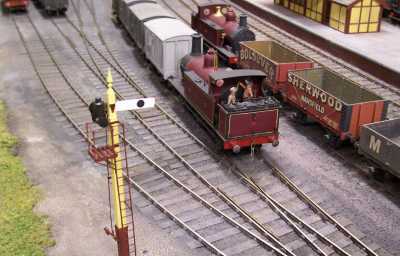 The following article by Graeme Lewis describes the signalling on his Ashworth 7mm scale layout. It encourages modellers to recognise the importance of signals in creating that genuine railway feel. 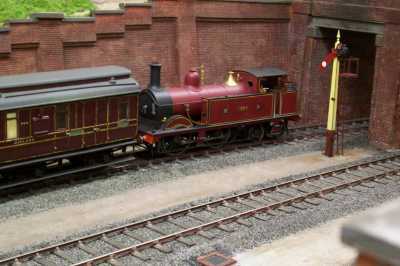 'Ashworth' won the MODRATEC Signalling Prize at the Brisbane Miniature Train Show in 2005 and 2006. © The content of this article copyright 2005 Graeme Lewis. Send email for Graeme Lewis via MODRATEC. Ashworth is a 7mm scale layout depicting the Midland Railway (MR) somewhere in the midlands of England in the year 1907. Whilst not a real location, the layout borrows the style of MR infrastructure to give the impression of a terminus on a short urban line, which connects with the main line to London and all points north. As a model it is a classic terminus to fiddle yard configuration which allows the complete layout to fit into my garage — with about 5mm to spare! It is somewhat different in portraying not only an urban scene but in also having a double track line plus a goods only branch line which enter the station. One of the fascinations of British railways is the signalling. The ability to run trains to a sequence (a timetable without time) with the points and signals operated from a lever frame was a major prerequisite for this layout. Unfortunately, even though the layout is 7.3m long (24') the layout is really too short for separate operators at the station and fiddle yard — allowing the use of bell codes and block instruments. Hopefully a future extension will allow this (to say nothing of the new garage!). So, signals are important to me in creating the feel of railway, rather than just a train set. The next step is to work out what you need. This is not so easy. The MR is remarkably well documented — but trying to work out how they would have signalled an imaginary location is quite difficult. There are many well known practices regarding signal design — such as the actual shape and colour of the signals — but it is what types and where that causes the difficulty. Fortunately the yellow faded quite quickly to a lighter yellow shade, while the Indian red became a bit browner. Note the ground signal — it is actually about three years out of period but is a good example of an etching being available whereas hand building a rotating disc (correct for period) would have taken too long for an exhibition deadline! All signals were lower quadrant semaphores (apart from a few tunnel signals) and used wooden arms with a cast iron frame for the spectacles. The signal arms were painted a little differently to what you might expect — all the arms were a reasonably deep shade of red on the front and white on the rear. 'Stop' arms had a white roundel on the front instead of the traditional stripe — with a black roundel on the back. Distant signal arms were exactly the same as the stop arms except for the vee cut into the end of the arm. Further, distant signals were used as repeaters for stop signals. We have an example of that on Ashworth, as shown below. In the example above the 'Up' passenger train is about to leave the scenic part of the layout and enter the fiddle yard. However, in our imagination there is a junction beyond the overbridge and the signal is a repeater for the stop signal protecting the Up line. A number of subsidiary signal arms were starting to appear at major stations by this time — such as 'calling on' and 'shunt ahead' signals. While these are very attractive to have on a model their use seems very limited away from major stations such as London St Pancras, Nottingham and some other major stations. The above photo shows starting signals for the three platforms and the goods sidings. Barely visible is the ground signal that controls access from the loco run round road to the goods line — see the photo above of the signal box — while out of scene (to the left) are the repeating signal and goods junction splitting signals. These latter signals are really cosmetic but are provided to indicate what is supposed to happen off stage. I also happen to like signals! This signal controls movements out of the goods sidings onto the Goods Line. Like Birmingham there is no trap point protecting the Goods Line — I guess because there are no passenger movements on that particular line. Sometimes less is more! My advice to anyone who wishes to signal a historical layout is to look at as many photos as you can find of the given period — and either side. You may be surprised at the changes that occurred in signalling practice. If working out where to put the signals is hard, you should try building them! In reality — like all modelling — the hardest thing is actually starting and then developing technique. On Ashworth the signals have been largely scratch built from brass, using some commercial etchings. I am fortunate in owning a pantograph milling machine, which allows templates to be made up at, say, 3 times model size. You simply trace around the template with a special follower while below the mill cuts out the part from brass sheet at the correct size. I also own a small lathe, which is used to turn up the finials for the posts, the lamp casings and sundry components. Having said that, you can buy most components and quite a few complete kits for many British railway companies from several suppliers in the UK (Model Signal Engineering and Scale Signal Supply to name but two). You can also cut the components by hand — it is just harder and slower. One thing which is worth doing well is the ladder and the post. A brass post will be infinitely stronger than a timber one, and far less prone to damage. Ladders can be made from strip brass with holes for the rungs drilled using a simple jig. Brass wire is soldered through the stiles for the rungs, and then snipped off and sanded flush. A ladder made this way is surprisingly robust and is not prone to the horrible 'waviness' you see on etched ladders. I accept that you probably wouldn't bother doing this in 2mm scale but I still think it would be worthwhile in HO and 4mm scales. On Ashworth both the points and signals are driven from a hand made lever frame using 1/8" brass rods under the baseboard, complete with cranks and reducers as required. In both cases the 20mm throw at the lever is reduced to 2-3mm at the point/signal. For signals a crank and steel wire is used to transmit the movement through the baseboard up to the balance weight mounted at the base of the post. There is a removable joint — detaching the wire and undoing two screws below the baseboard allows the signal to be pulled out leaving a square hole for the post and two small holes for the ladder stiles in the ground work. As yet I have minimal interlocking on the points and signals — I wish I had met Harold [MODRATEC Help - ed] about 5 years ago! Future changes may well see a MODRATEC interlocking lever frame installed. There has been no attempt to make the signals bounce or to light them. Both are possible and are nice features — I simply have too many other things to do! For those of you prevaricating on signals I would urge you to take the plunge. They add enormous operational interest — at home, on club nights and at exhibitions. They make a model look like railway. I would recommend starting with some proprietary products first and get them to work — I am sure you will enjoy it!